It is difficult to find the right sentence. JR Pahulas (left) is traveling home to his wife and son. JR is trying to travel home to his wife and son. Or perhaps, more accurately, JR is traveling, to discover if he still has a home, or a wife, or a son. It is the last sentence that makes him afraid. JR squints against the sun. He stands at the side of the road, lanky and sunburned, smoking a shared cigarette. A grey duffel is slung over one thin shoulder. He hails a United Nations SUV, a tricycle, a Red Cross van, a bus. It is the last leg of a long journey to the village of Dulag. 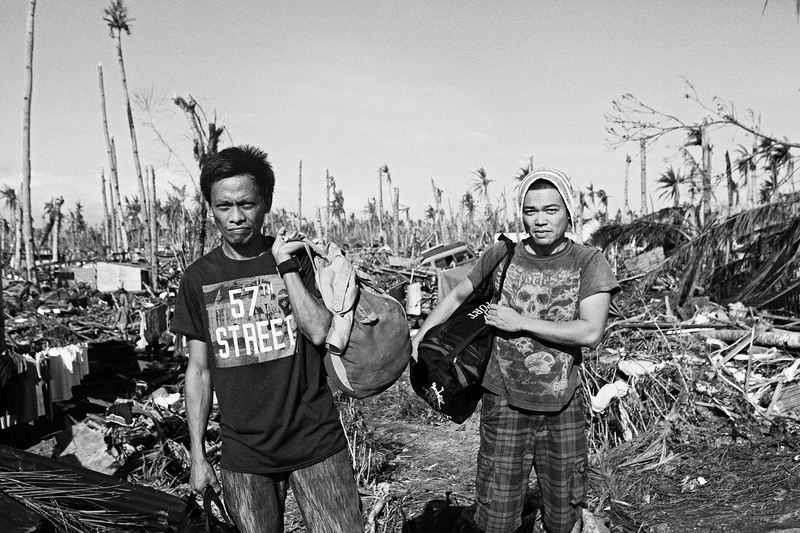 He was in Metro Manila when Yolanda ripped through his hometown. He was born in Leyte, grew up in Leyte, and lived in Leyte until 5 months ago when he went to work at a Bulacan chicken farm. He called his wife when he saw the news about a storm that would level his province. He told his wife to evacuate. His wife said there was no need. Her brothers said Yolanda would pass them by. It was JR who was afraid. He talked to his wife at 7 in the evening of Thursday night. It was the last time. The next morning he watched the news, saw the wind and the water slamming against the shoreline. He called his wife. He called her brothers. He called everyone he knew in Dulag. He couldn‘t get through. JR decided to go home. Went to every ticketing office, tried to book a seat, was told it would be days before the planes could fly. He found out there were still buses, and started packing his bags. He heard he couldn’t bring much, that people would hijack buses for food. He bought a few packets of biscuits and not much else. He didn‘t really care. He couldn‘t eat. He has been on the road for 3 days, sometimes traveling alone, sometimes with other men worried about wives and mothers and children. They would buy tickets when they could, hitchhike when they couldn’t. They would stop to sleep at police checkpoints or anywhere with a military presence. On the night before he stood beneath a Tanauan waiting shed, JR slept at a gas station in Tacloban City beside a pile of corpses. He bore it for one night because he had to, but he couldn’t understand how the others who had chosen to pitch their blankets beside him could live there everyday. It was where they ate, where they slept, where they washed their clothes and nursed their babies and huddled in the rain, occasionally covering the dead with more sheets of plastic or mats too tattered to use. Now he stands under a waiting shed in Sto Niño, Tanauan, Leyte. He has been standing all morning at corners and under sheds, but the buses don’t stop. He understands why they don’t. There have been looters wandering the streets, and perhaps the drivers think he is one of them. JR is tired. He hasn‘t showered in three days, and he knows that going home means finding out why his wife has sent no word. He hopes she is alive. He hopes his child is alive. He doesn‘t say what he is afraid of, he only talks about what he hopes for. But he knows it, and he knew it the moment he bought a ticket in a Cubao bus station. He crosses to the other side of the road, across the waiting shed, hailing every car and truck and bus. When he raises an arm, a bus stops. When it moves again, JR is gone. JR Pahulas is traveling home, to find out if his family is dead.